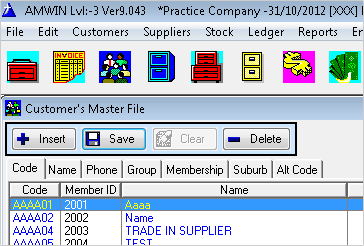 AM-Win is the most powerful management accounting software package ever released by NEW AGE BUSINESS SYSTEMS PTY LTD. Affordable, user friendly and feature packed, it allows you to have greater control of your business. It contains easy to understand screens together with step by step help modules. AM-Win Software is an Australian developed software package specialising in the development of business management systems for Australian and New Zealand businesses. Our software products provide strong functionality to control sales and servicing of customer and internally owned equipment with a strong emphasis on sales, servicing, hire and maintenance. AM-Win make software programs and software applications and “off the shelf software” packages that are specifically designed for automotive workshop management, mower, motor cycle, aircraft maintenance, marine, forklift, small engine, aircraft maintenance, small engine, motorcycle, marine and other service industry businesses as well as equipment sales service and hire businesses. AM-Win is a modular software system with easy to see graphics and help modules. Business Activity Statements are simple to organise within ASIMS as all modules are interrelated. Profit by Day, Job, Month, etc. © 2019 Aussie OnSite (AOMM).